The popular Early 2015 refurbished Gold Macbook with 1.2GHz processor is at the top of everyones shopping list. It gives you everything youre looking for in an affordable Mac laptop  high speed, light weight and low cost. The highly efficient Intel Core M processor blasts through graphics and business applications. And with the breathtaking Retina display, you get the resolution and clarity of an external monitor. 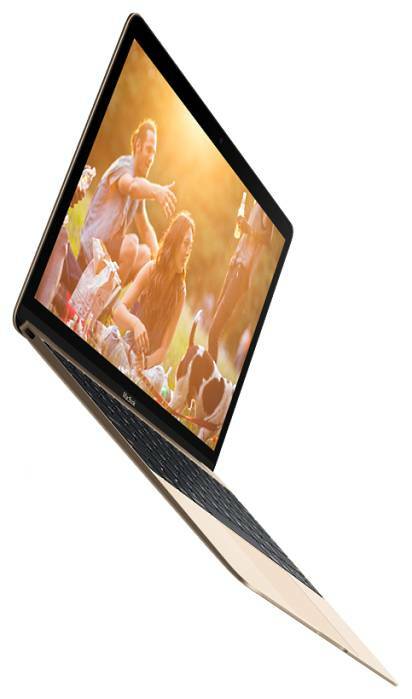 The refurbished Early 2015 Gold Macbook is the laptop of the future on sale now at GainSaver. Order yours today! As small as it is, the used Early 2015 Gold Macbook opens up to reveal a full size keyboard thats highly responsive and accurate. The keys are also bigger, and designed with Apples new Butterfly mechanism to ensure the stability of the keys as you press down on them. Theres no wobbling even when you push a key near the edge. The backlighting behind the keys has been improved. Each key has its own LED light, reducing excess light so that it doesnt escape around the edges of the keys. The keys are evenly lit from below and the characters are sharp and easy to read. Youll find typing on your discount Early 2015 refurbished Macbook is a pleasure, even in the most dimly lit places. The 12-inch used Gold Macbook has a remarkable display with over 3 million pixels, giving it a resolution of 2304 x 1440. Thats higher than standard HD resolution! Your images and videos will have clarity and sharpness youve never seen before on a 12-inch screen. You can use the added resolution to create a gigantic desktop that will comfortably display many open applications and document windows. Youll also be able to show more icons, buttons and menus to increase your productivity. The powerful Intel Core M processor in the Early 2015 cheap used Gold Macbook runs at a fast 1.2GHz. But it uses power so efficiently that youll need to recharge less often. Not only that, using less power means less heat is generated by the Core M processor. It runs so cool that the fan has been removed, making the refurbished Early 2015 Macbook completely silent. There are no moving parts to make distracting noises. Youll love the experience of using the Force Touch trackpad on the used 12-inch Gold Macbook. All of the Multi-Touch gestures you know still work just the same way. And by pressing down on the Force Touch trackpad, you can access a whole new range of commands. The Force Touch trackpad can be use to do pressure-sensitive drawing, opening up new possibilities for graphics programs. Hidden under the Force Touch trackpad is the new Taptic engine, which gives tactile feedback. Depending on the application you are using, the Force Touch trackpad can generate vibrations you can feel with your fingertips to confirm whats happening on the screen. Its a whole new experience  and a lot of fun to use. Your GainSaver purchase of the used and refurbished Early 2015 Macbook includes a free 30 Day Money Back Guarantee. If you are not completely satisfied with your GainSaver refurbished Macbook, you can return it within 30 days for any reason. No questions asked. Only GainSaver offers an afford way to protect your used Macbook investment beyond the 30 Day Guarantee. The GainSaver Extended Warranty is available for 6 months to 3 years of extended coverage. For very little additional charge, you can get the same no questions asked protection for as long as you want it.